1. Tina from Life in the slow lane at Squirrel Head Manor, found Batali scary, but loved the book: Heat is a good read, lots of interetsing insight from a kitchen slave’s point of view, lots of good quotes and it’s entertaining. Early on Buford states he was captivated by the kitchen’s smells and by midmorning, when many things had been prepared…all was cooked in quick succession. The waves of smell, like sounds of music, lamb, chocolate, tripe, octopus, huckleberries and then the comforting chemistry of veal, pork and milk as someone prepared a Bolognese. Although I thought the book was an interesting read, I never really felt like I connected with Buford. In all honesty, I thought he was a bit frivolous and self-involved. Especially when he did things like decide on a whim to travel to Italy to learn how to make pasta without a thought for his wife or his career. Reckless. And unnecessary. 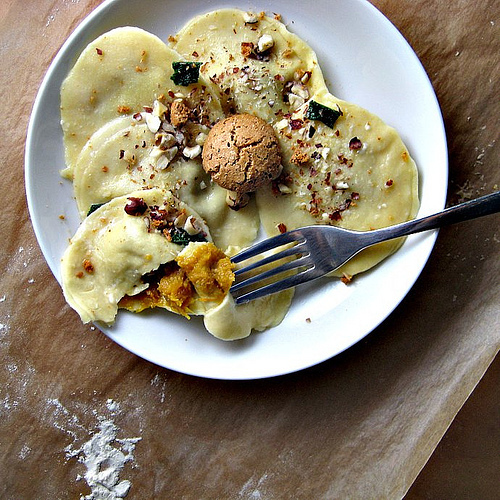 Joanne prepared pumpkin ravioli with sage and toasted hazelnuts for CTB. They were a huge hit with her friends, mainly because the filling was not so sweet due to teh presence of balsamic vinegar. Glennis used to have her own hens and knows a thing or two about eggs. I will have to agree that especially when making pasta, the egg is of great importance, as there are so little ingredients involved. 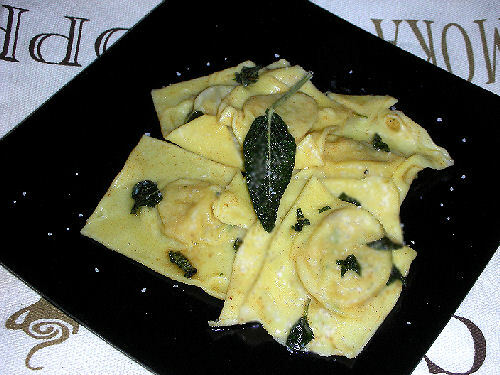 It is a pity that the filling did not turn out as well as she would have liked it to, since the yams were Asian and slightly dry, but i find that her ravioli look really good! For my book-inspired dish I decided to make pasta. One that I had never made before. 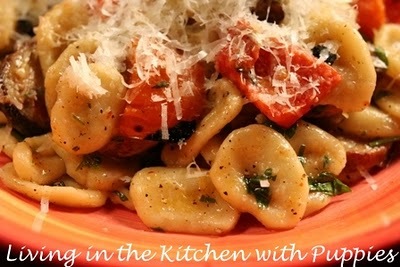 Orecchiette, little ears. I found a Batali recipe and sat down to make them. It took me 2½ hours, and the first batch of the little ears were rather irregular in size, but by the second I had the hang of it. Bill’s right, you only learn by repetition. And lots of it. For her finished dish, she grilled hot Italian sausages and peppers, drizzled everything with olive oil and topped her pasta with loads of freshly ground parmesan. What a feast! To avoid the hassle of filling the ground meat into casings, I wanted to make some cevapcici-like fingerlings and wrap them into caulk fat. Sounded like a good enough plan, but unfortunately I ran into diffculties from the get-go. First, the nozzle of the (new and not-that-cheap) hand-cranked meat grinder was so low, I couldn’t use an ice bath but had to catch the meat in a glass casserole. Then the suction cup on the bottom of the meat grinder gave in, which made grinding meat really hard and very time-consuming work. Due to the slow going the fat and meat (predictably) warmed up and began to clog the die. After going through maybe 200 gram of the 1.25 kg total (I used a half-batch of the recipe given below.) I decided to form the ground meat into a fingerling, skip the wrapping in caulk fat and just fry it. 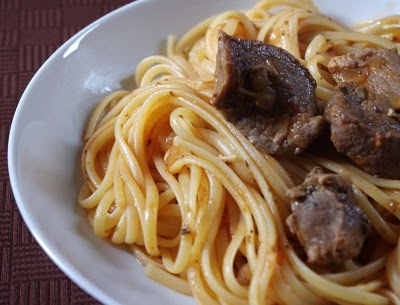 He used the sausage meat to make some bolognese style sauce with which he topped freshly boiled spaghetti. I think that it all turned out well in the end. Now, unfortunately, with my new found appreciation for Mario, I’m still never going to be able to watch his show. Why? Because I’ll never see him the same way again. Maybe if he wore long pants. But with those shorts…and the orange clogs….I’ll only ever have one image of Mario burned into my brain. And that, my friends, is his calves. No, Mario doesn’t raise cattle (as far as I know). I mean his beefy, hairy CALVES. You know, the part of his legs that rests just below his shorts and above his signature orange clogs? Yes, THOSE calves. 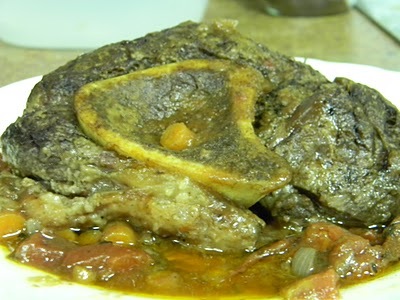 Despite that image Beth-Anne was actually INSPIRED by Mario’s calves (and is not the only one) and so she made Mario Buco (ossobuco). 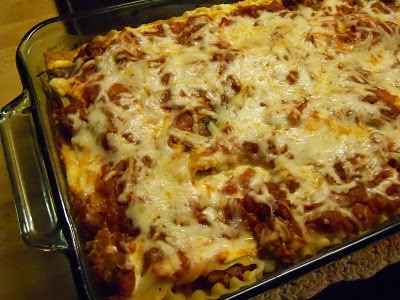 The meat turned buttery soft, the hubby loved it, and that ugly image of Mario’s calves was transformed for ever! I find his disdain for all things French unwarranted and uncomfortable. 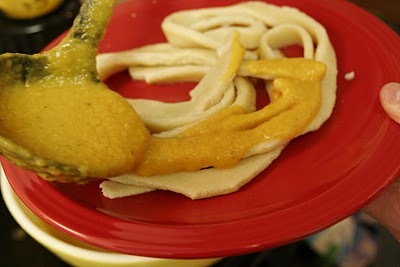 Nicole decided to bring the two cooking traditions together, so she made hand rolled fresh pasta, but she teamed it with a very French sauce ofApple and Roasted Butternut Squash. It was her first attempt to making fresh pasta and she admits she would not do it again without the use of a machine. I totally agree with that, despite what Italian’s might think about machine rolled pasta. It just makes things so much easier! I thoroughly enjoyed Mr. Buford’s telling of his experiences in various professional kitchens, particularly the tales of Mario Batali’s kitchen in his three-star restaurant, Babbo. Based on my limited professional kitchen experience, I found his account to be entirely believable. Although most of my restaurant experience has been from the other side of the heat lamp as a server, I have witnessed first hand the ginormous egos that take up most of the room in these kitchens already lacking in space. Twelve years ago, Kelly had the opportunity to work as a cook in a professional kitchen in a Greek bistro, under a very macho Greek man (oh, my, do I know what those are like…) who was a close friend of hers. She could not stand the heat so she left his kitchen, realising that the life of a cook is not for her. 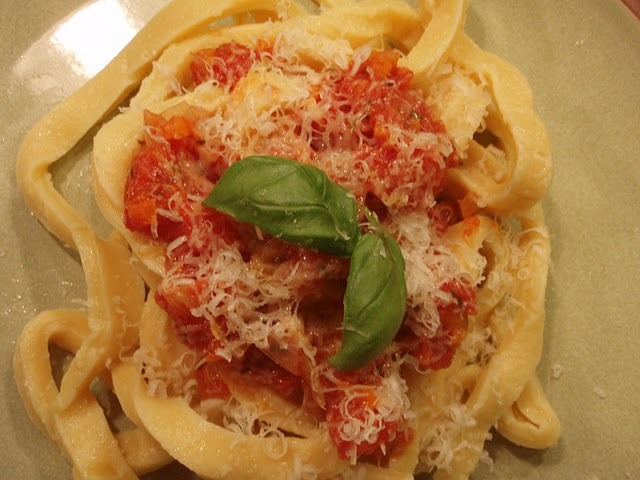 Throughout the book it is said over and over again that a good pasta dish is about the pasta, not the sauce. So I decided I would make fresh pasta for the first time and then at Mr. Batali’s suggestion, top it off with just a basic tomato sauce in order to let the pasta take center stage. My favorite parts of the book are those where he describes himself dealing with the tasks he is given, like when he browns ribs and burns himself with hot oil (pages 72-73). 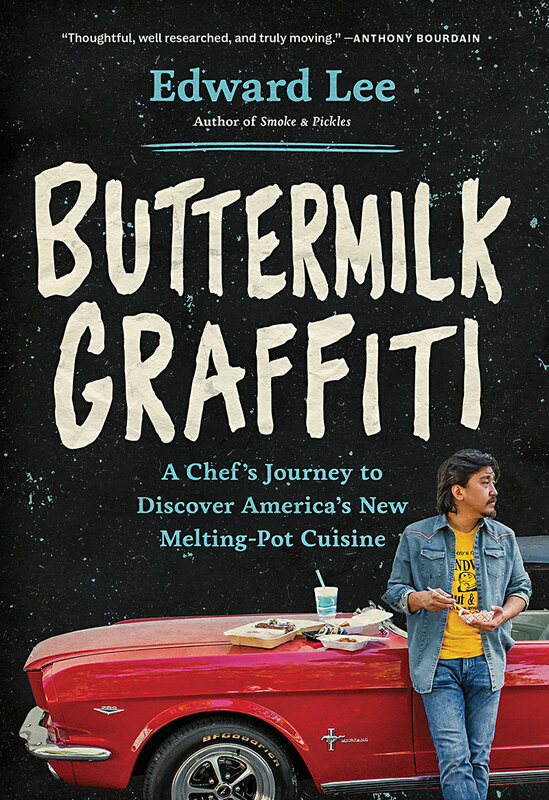 Less interesting, in my opinion, are the parts where he talks about Mario Batali and other mercurial characters. Simone decided to make purple potato gniocchi following a mild obsession of hers. She tried several types of potatoes and ways of cooking them before finding the perfect balance between the three ingredients needed: potatoes, flour and salt. 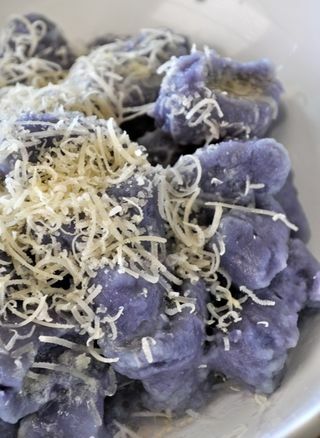 She gives many tips and tricks about this beautiful dish and If you love gniocchi you should definitely read her post! What was Buford doing? If he was writing a biography of Mario Batali, it was superficial. If he was going for a guts-&-all kitchen exposé, he just isn’t Bourdain. If it was supposed to be a bildungsroman of his growth into cooking, well, he didn’t give enough of himself to make me feel the journey. He spends too much time hiding in the shadow of (somewhat tediously) larger than life characters for me to really be that interested when he finally steps out into the sun. 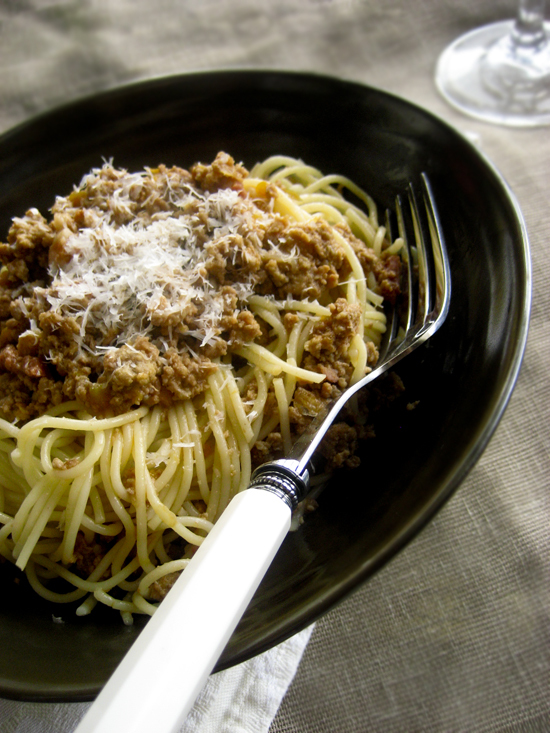 Since meat greatly features in the book, Alicia made Spaghetti Bolognese. But not just any bolognese, a magnificent gamey one, with three types of meat and chicken livers. What a treat that must have been to eat! I truly admire Buford’s incredible verisimilitude in reporting. To go through learning all the steps, from hours, months of mundane prep work, to apprenticing at the stations for pasta, grill work and plating, not to mention, of course, enduring the intense heat (physically and emotionally) back there in the kitchen, including real abuse from some of the chefs. His book could have alternatively been titled, Life on the Line. It sounded like hell to me. Not anywhere I’d want to be. Though, I’m glad he did, so we could read about it. She also admits that she doesn’t enjoy the pressure of cooking for many people and would rather dress up and go to a restaurant instead ! 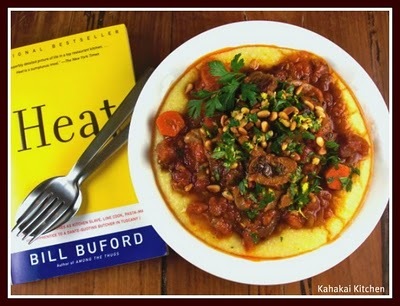 Since Claudia, owned the Babbo cookbook already, she was actually inspired byHeat to start cooking from it and made braised short ribs, gremolata and polenta. Apparently, hubby loved the ribs so much he expects them on his plate once a week! Joe is the laconic scion of the Bastianich restaurant empire and Batali’s business partner. He knows food and wine and how to keep the finances afloat in the Batali restaurant galaxy. He does not wax poetic about the glamour of restaurant life, having had to clean out the grease traps, pull bay leaves out of choking throats and sweep up piles of post-exterminator insect detritus in the family restaurant. Marco Pierre White is an even more outrageous, larger-than-life character than Batali, who endured a four-month stint as White’s kitchen slave in London before quitting in a fit of pique. White is so very foul-mouthed, so mean, so physically intimidating, as described by Buford, that even when the two meet, over a frightfully proper traditional roast grouse meal at White’s newest restaurant acquisition, he works himself into an increasingly cold fury ruminating on every bit of the dish that is overdone or incorrectly prepared. 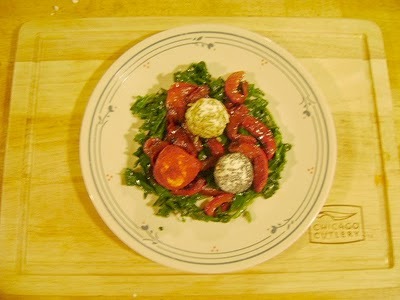 Rachel decided to make a very elegant appetizer, Mario Batali’s Goats Cheese truffles with pepperonata. I was actually really taken by this recipe as I have never tasted blanched arugula before. Will definitely try it soon! The book is eye-opening and slightly discomforting. “Bad Boy Chef” works well for Anthony Bourdain, but with Mario Batali it seems strange and slightly creepy. I did enjoy this book, although for exposing the back of house of the restaurant world, Bourdain still gets my vote for #1. 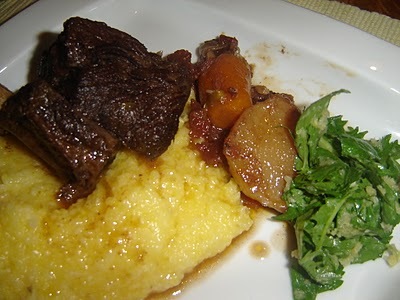 Deb was also inspired by Mario’s calves and cooked an Osso Buco with toasted pine nut gremolata and Polenta con Parmigiano. 14. I (foodjunkie) also decided to make a Bolognese based on Mario Batali’s recipe. I was just recovering from a cold and needed something satisfying and yummy. 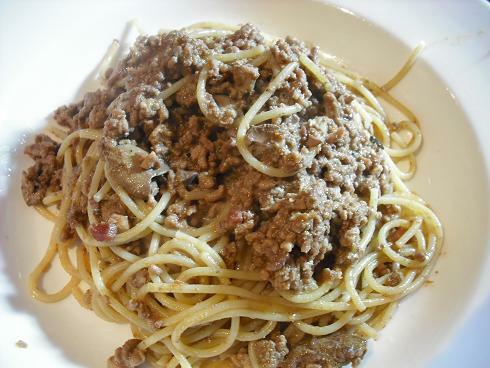 Bolognese is very similar to a Greek dish, “makaronia me kima” (pasta with mince), but due to its richer nature it tastes very different.